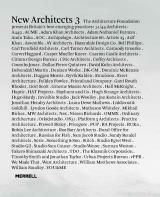 New Architects 3 showcases the wealth of emerging architectural talent in Britain. It provides a unique guide to over 85 of the most innovative young architectural practices, many of which are destined to become the leading architects of tomorrow. With this book, the third in a groundbreaking series that began in 1998, the Architecture Foundation continues its tradition of championing new generations of architects. Almost 20 years after publication of the first guide, the British architectural scene remains lively and diverse, with London marked out as arguably the pre-eminent international city for ambitious design, yet it is still difficult for young practices to gain significant commissions. This brand new edition, featuring practices selected by a jury of architectural professionals, represents the next generation of talent, and will be invaluable for all those interested in creating the best new additions to our built environment. The book presents a comprehensive, independent expert assessment of each featured practice, along with contact details and a total of 450 colour illustrations of recent projects. Offering both practical information on how to get the most out of the client/architect relationship and an overview of the architecture scene in the UK, New Architects 3 will serve not only as an important reference for clients, advisers and urban planners, but also as a resource to inspire readers and celebrate the value of high-quality contemporary architecture. The Architecture Foundation is an independent, non-profit agency that promotes architecture and urbanism. Since its foundation in 1991 as the UK’s first independent architecture centre, it has organized hundreds of design initiatives, events, exhibitions and education programmes in public venues across Britain and internationally.